Each artist creates super heroes that reflect their own cultures. Their adventures in that new world feature battles and dragons. Together in their colorful paintings they cross the divide that has separated them. The boy writes, “Now after years of searching for the right words, we find ourselves happily… SPEECHLESS.” When the boy goes home he has his grandpa’s ink brush. The grandpa waves good by with the boy’s markers clutched in his hand. The power of art to communicate unites the two in a new relationship. 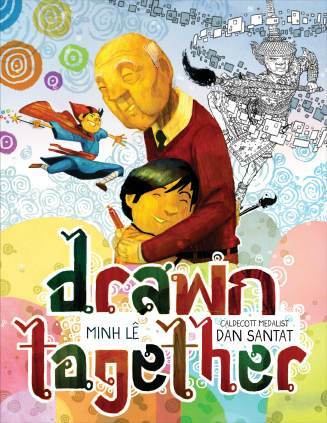 Santat is a gifted artist and this book is a departure from his usual style. Compare the illustrations in his 2015 Caldecott winner, Beetle, with this new book. The dragons and fantastic adventures in the world grandson and grandpa create are vivid and almost leap out of the pages. Many pages are without text with the illustrations carrying the story. Dramatic details and action fill the pages. The beginning and ending of the story feature small mostly wordless panels that first show the characters struggling to communicate and then at the end parting with a new appreciation of what they have shared. When the world they create together begins the pages feature large figures with culturally specific motifs.